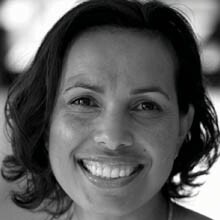 Frances Rings is resident choreographer of Bangarra Dance Theatre. Her work was recognised at the 2010 Helpmann Awards, with Bangarra taking out Outstanding Achievement in Choreography and Best Regional Touring Production. A descendant of the Kokatha tribe, Frances was a principal dancer with Bangarra for 12 years and has performed with Australia’s leading choreographers; Meryl Tankard, Leigh Warren and Legs on the Wall. Frances made her choreographic debut for Bangarra in 2002, with the work ‘Rations’ in the season ‘Walkabout’, to outstanding critical acclaim. She has now created four works for the company: ‘Bush’ (co-choreography), ‘Unaipon’, ‘X300′ and ‘Artefact’, and was appointed resident choreographer in 2010. In 2004, following the world premiere of ‘Unaipon’ at The Adelaide Festival of Arts, Bulletin magazine named Frances in their ‘Smart 100′. She went on to choreograph works for leading dance companies the West Australian Ballet and Tasdance, while continuing a successful independent career. As well as the latest Helpmann Awards she received for her work ‘Fire’ and the production ‘True Stories’, Frances’s other honours include the Helpmann Award for Best New Australian Work for ‘Walkabout’ (2003), the Deadly Award for Female Dancer of the Year (2003), and the National Dance Award for Outstanding Achievement in Choreography for ‘Unaipon’ (2004).